The generic name comes from the Latin word “uro,” which means “I burn.” This is a dioecious plant, with male and female flowers growing on separate plants. The species name “dioica”, means “two households” in Greek: By late spring, some plants have clusters of tiny, green female flowers, hanging from the leaf axils in paired strands. Associations: the element of fire, midsummer. 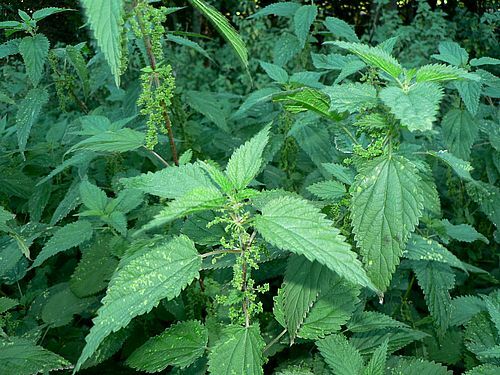 People have been using nettles for food, medicine, fiber and dyes since the Bronze Age. Nettle, like mustard and holy thistle, is a sure indicator of a relatively rich soil. Nettle is one of the nine sacred herbs of the Anglo Saxons. The nettle in England was traditionally supposed to have been planted by the Roman legions of Julius Caesar. Unused to England’s miserable and freezing climate, they frequently found their limbs chilled or even numbed by the frost or sleet. As a remedy they plucked the nettles and then scourged their legs and arms with them. After this they enjoyed the warmth of the inflammation. Nettles’ long, fibrous stems were important in Europe for weaving, cloth-making, cordage, and even paper. Native Americans used them for embroidery, fish nets and other crafts. You can extract a yellow die from the roots. Nettles have a bad reputation as an unpleasant-tasting survival food in some circles. That’s because people don’t know how to prepare them. They often boil them, which is awful. Nettle leaves are good simmered in soups 5-10 minutes. Nettle tea is given to house plants to help them grow. Legend has it that to hold nettle in one’s hand insures one against any fears of hallucinations. Nettle is an annual or perennial herb. Nettles usually appear in the same places year after year. Sometimes nettles grow near catnip, another similar-looking plant. Catnip and nettles are an excellent combination for herb tea. Harvest before flowering. They may be bad for the kidneys after they flower. New nettles come up in the fall, and you can pick them before they’re killed by frost. Collect them using work gloves, and wear a long-sleeved shirt. If you happen upon nettles when you have no gloves, put your hand inside a bag. The young leaves are the best part of the plant. They come off most easily if you strip them counter-intuitively, from the top down. Clean and chop nettles wearing rubber gloves. Steam them, freeze them, dry them, tincture them in alcohol. * Once you’ve cooked them a little, the stingers are deactivated, and the plant becomes wonderfully edible. Provides protections against demons and evil spells. Nettle leaves provide good protection against psychic attacks and help remove negative energies. For removing curses and hexes, mix with Jinx removing powder and sprinkle in each room and doorway. Nettle is an aggressive plant with many properties and vital minerals that are essential in many disorders. It is a cleansing, detoxifying, astringent, diuretic, anti-inflammatory, nourishing and anti-allergenic herb. It is rich in sulfur and it contains manganese, silicon, iodine, potassium, sodium, calcium, magnesium and iron. It is a good source of vitamin C, B complex vitamins and it provides chlorophyll and easily absorbable amino acids. They’re ten percent protein, more than any other vegetable. * Nettles are usually used along with other herbs that target the affected organs. Use capsules of freeze-dried extract of stinging nettle instead of antihistamines to alleviate minor hay fever symptoms. Make a tea out of nettles and chamomile for a hay fever remedy. Bathe the sunburn with an infusion of stinging nettles, chamomile or calendula. v As food, this tonic is good for rebuilding the system of chronically ill people. v Nettle infusion is also recommended for weight loss, but you may shed more pounds of water than fat. v Nettle infusion is a safe, gentle diuretic, considered a restorative for the kidneys and bladder, and used for cystitis and nephritis. v As an expectorant, it’s recommended for asthma, mucus conditions of the lungs and chronic coughs. v Nettle tincture is also used for flu, colds, bronchitis and pneumonia. German researchers are using nettle root extracts for prostate cancer. v Russian scientists are experimenting with nettle leaf tincture for hepatitis and gall bladder inflammation. v Joint injuries: Use the fresh plant to sting the area over the injury. This use, called urtication, was once traditionally used to address injuries resulting in impaired nerve function, loss of sensation and paralysis. It may also be used to address inflammation in joints; it is specifically useful in tendonitis and other repetitive stress injuries (and has been used effectively in various forms of arthritis as well). Probably, it works by calling blood to the area affected. Because the sting can be uncomfortable, people have shunned this use, but the long term benefits greatly outweigh the short term discomfort. v Nettle tea compress or finely powdered dried nettles are also good for wounds, cuts, stings, and burns. The infusion was also used internally to stop excessive menstruation, bleeding from hemorrhages, bloody coughs, nose bleeds and bloody urine. It helps blood clot, but major bleeding is dangerous and indicative of a serious underlying condition. ***Consult a competent practitioner in such cases. Use for minor cuts. Herbalists have long prescribed it as a specific for both childhood eczema and nervous eczema. *** Nettles sting you because the hairs are filled with formic acid, histamine, acetylcholine, serotonin (5-hydroxytryptamine) plus unknown compounds. Some of these substances are destroyed by cooking, steeping or drying, but not by freeze-drying or juicing. However, you can purchase freeze-dried nettles in capsules for hay-fever. Nettle tea: Nettle tea is a superb detoxifying, cleansing tonic for the whole body, and is particularly beneficial to the liver and kidneys. It can help sooth eczema and irritated or inflamed rashes and skin conditions. Nettle tea is also a valuable remedy for anaemia caused by heavy menstrual bleeding. It is one of the most nourishing drinks. Eating nettles or drinking the tea makes your hair brighter, thicker and shinier and it makes your skin clearer and healthier, it is good in facial steams and rinses. *Some people find nettle tea rather bland in flavour, but nothing a dash of honey or lemon cannot solve, or try blending it with a more aromatic herb such as Lemon Balm. Cool minty, citrus flavour to assist you with the discomfort associated with the allergy season. Place all herbs in a tea ball or bag, put in a cup and cover with boiling water. Steep for 10 minutes. Remove the tea ball or bag and add sugar, honey, sweetener, milk or cream to taste. Steep the stinging nettle for about 3-5 minutes. You can sweeten the nettle leaf tea if you have a sweet tooth. Use nettle to make an herbal vinegar that can reverse and counter osteoporosis. Dose is 2-4 tablespoons daily. Nettle & Lemon Balm: A detoxifying, cleansing, tonic brew, the Lemon Balm is soothing on the stomach and uplifting for your emotions. I.e ideal to throw off winter’s shadow. HERBOLOGY by Bruce Burnett, Chartered Herbalist.